As with everything, personal taste is the key. 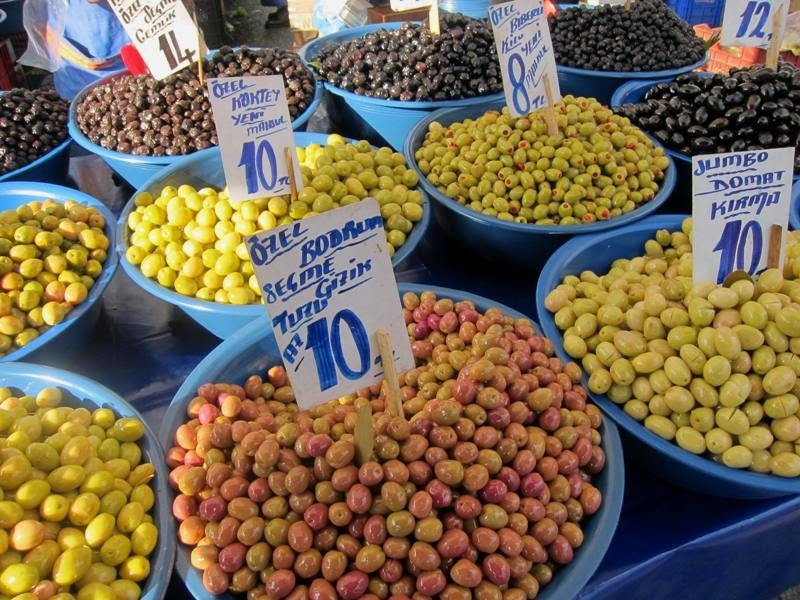 In Turkey you will generally find an amazing choice of olives in the local street markets although probably not in places inland away from the coast. 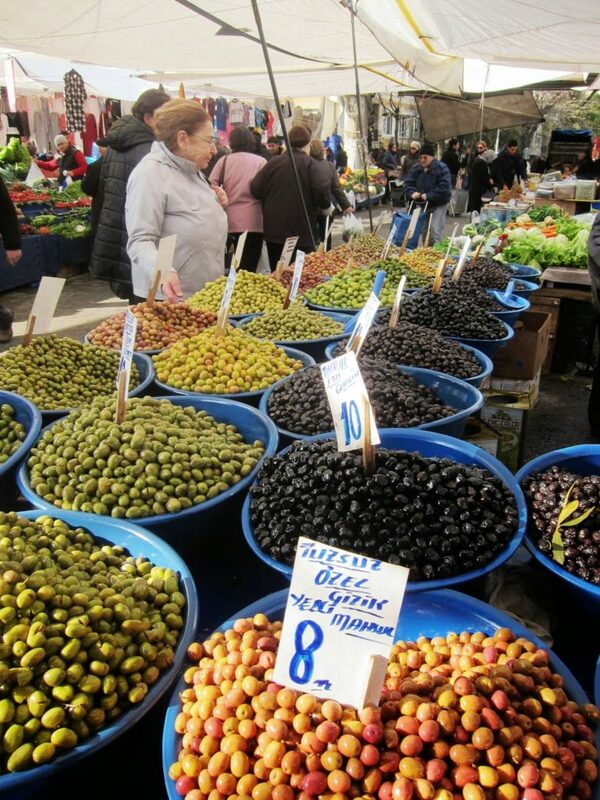 Of course olives are ubiquitous in Istanbul and can be found in corner shops, supermarkets and the big hypermarkets like Carrefour. Not to mention little villages especially along the Aegean coast that you may happen to visit. 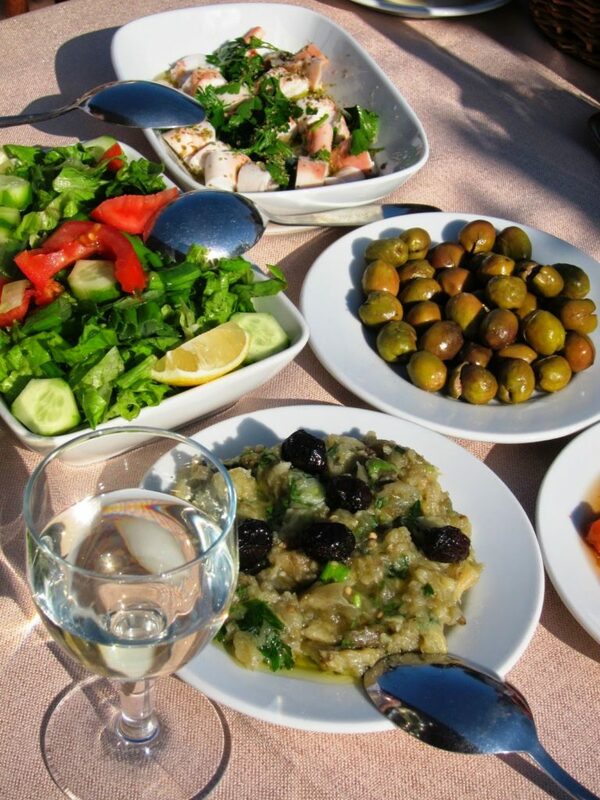 Olives are an integral part of the Great Turkish Breakfast! Along with white cheese or feta, tomatoes, cucumbers and perhaps rocket or parsley, what more could you ask for to prepare you for your forthcoming day? Just add a slice or two of fresh bread, maybe a boiled egg (organic, of course!) and in my opinion, you are all set! 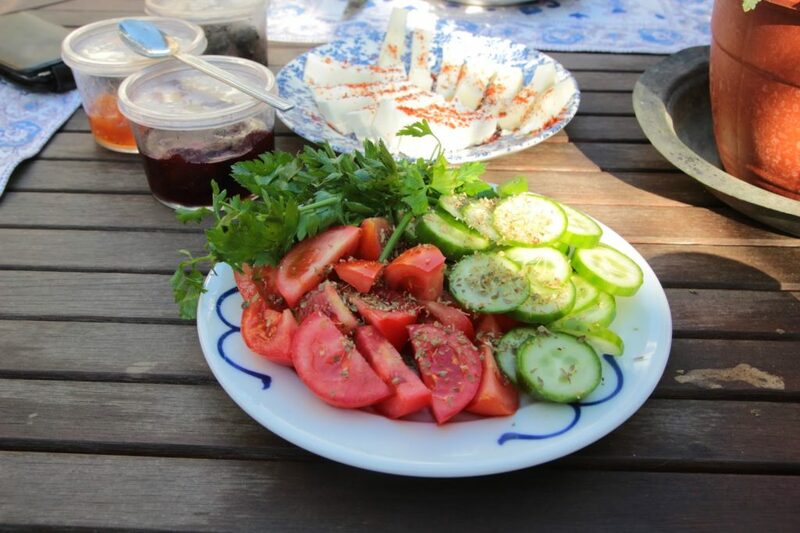 Forget all those commercial cereals and think Mediterranean! Did you know that both green and black olives come from the same tree? The green ones are simply the unripened ones. If left on the tree, they will become black. Even so, a whole tree won’t be stripped at the same time as it depends on how fast each individual branch ripens. In the Aegean region you will see whole families out in the olive groves from October on, picking olives by hand. It isn’t easy to pick the olives as the weather can be bitterly cold. The season ends at approximately the end of January. 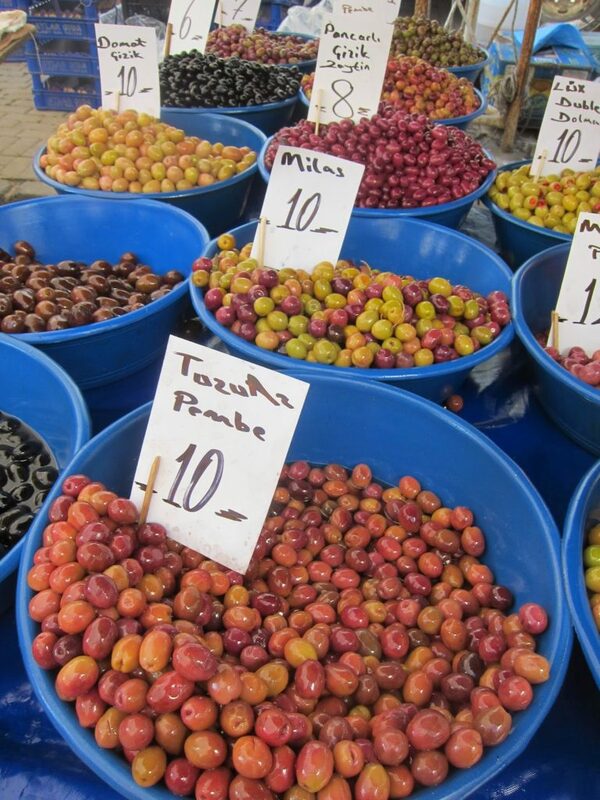 Click here for more pictures and info about the Iznik olive harvest this year. You cannot pop a green olive straight into your mouth however much you want to! It will taste too bitter. 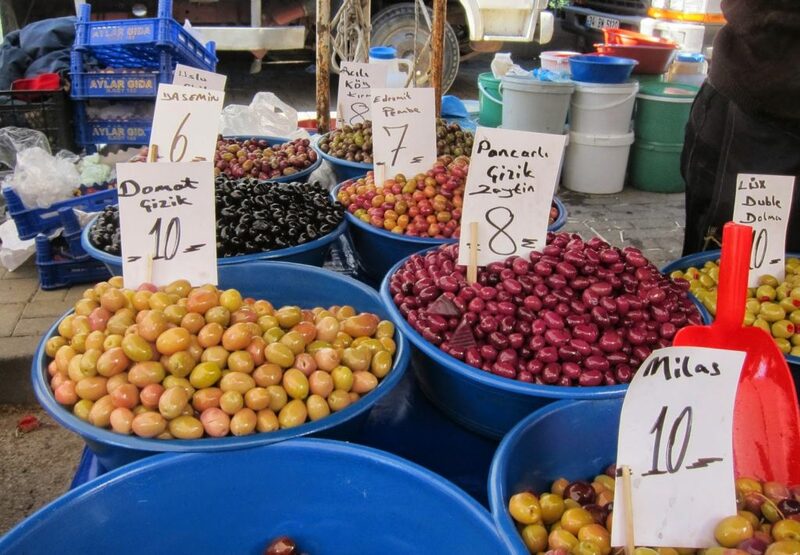 This is why you will see green olives with slits or cuts in them marked kırma or çizik. In fact, kırma means broken: the olive has been hit with a stone or hammer and literally broken. Çizik means slit: this time the olive has been slit with a knife. The reason is to release the bitterness inside. Those green olives will then be soaked in a briny solution which is changed every few days so that the olives are rendered edible. The ones treated this way will also be available for sale that much quicker. 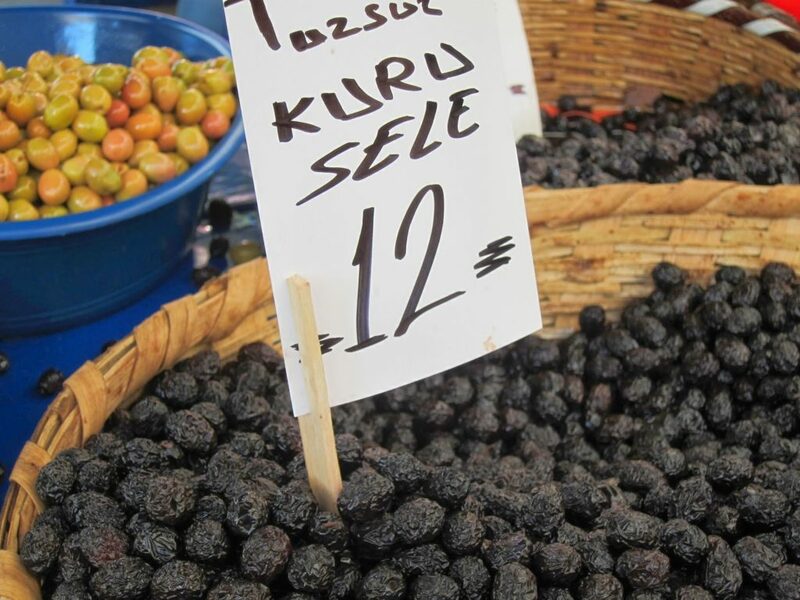 In Turkey, the black olives from the Gemlik area just south of Istanbul are generally thought to be the best breakfast olives. 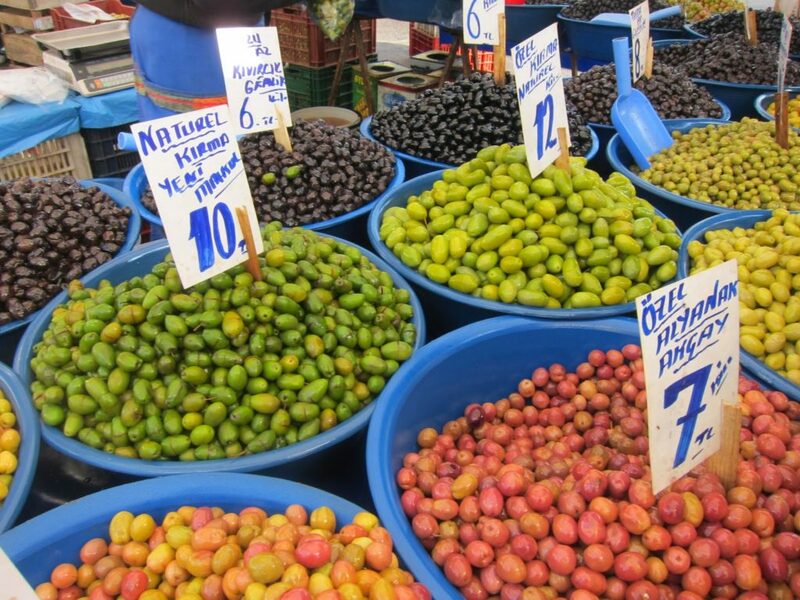 Going down the Aegean coast as far as Ayvalık will bring you to the best area for olive oil. Sızma is what you should look for: ie virgin olive oil. This means the product of the first crushing. The quality of the olive oil depends on the speed with which the olives were picked in the first place. Olives are preserved in one of two ways: sele or salamura. The first means simply with salt: layers and layers of coarse salt are used. This is why sele olives have a wrinkled appearance and can be very salty when you buy them. The second method uses both water and salt. In fact, they can all be pretty salty upon purchase. But don’t let that put you off! When you get home, rinse them under the cold tap and put them in a bowl. Cover with cold water and leave overnight. Try one the next day: it may be OK but may need more soaking in clean water. Continue doing this until the excess saltiness has disappeared. Once this point has been reached, you can pour olive oil over them and add a few slices of lemon too – this is just for your own pleasure. You actually don’t need to do anything as they keep extremely well just in a jar in the fridge and will keep for months like this. Pricewise, you will see a lot of differentiation ranging from 5 TL per kilo all the way to approximately 28 TL. (These prices are as of yesterday). The cheaper ones will definitely be of inferior quality, probably softer than usual, the others just differ in size, location of the olive grove, ease of transport, and of course, overall taste and quality! Personally, I prefer my olives to be ‘etli‘ which literally means meaty. This may sound a bit gross in terms of olives but simply implies substantial. 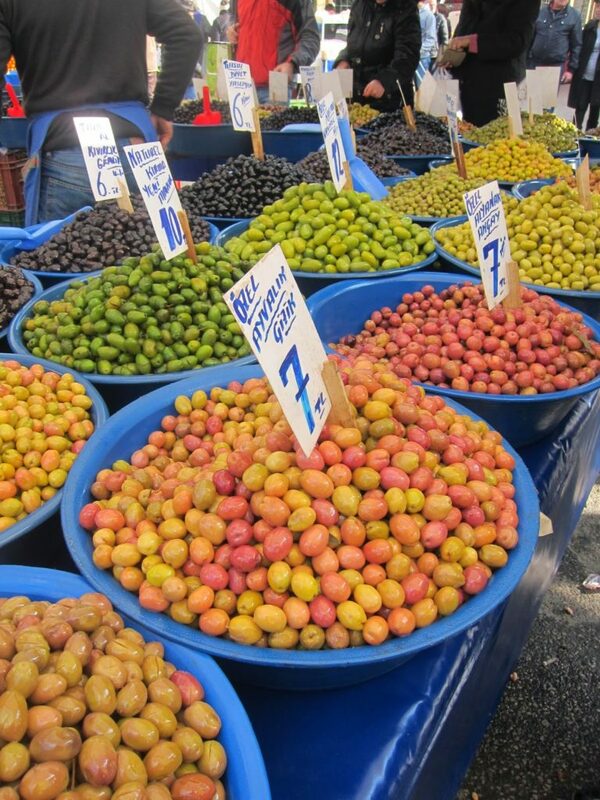 So it is quite normal when out and about looking for olives to buy, to stop at a stall and sample a few first. If you do this, I think it would be polite to buy from that stall! But if you truly didn’t care for the taste of those you tried, no-one would think any the less of you for strolling along to another vendor. The choice is endless and it’s all yours! With a little bit of experimentation, you’ll soon discover your favourites!